A work team of 16 will be arriving in Haiti the last week of August to help me finish the La Gonave Ministry Center/Guesthouse. The team is made up of several experienced construction workers and several workers with very willing and able hands. 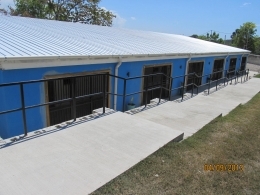 The plan is to finish as much of the building as possible during the team’s time in Haiti. We have been praying and asking for the remaining funds to be supplied all summer but we still need more funds. Please join us in praying for the final $15,000 to come in. We are trusting God to supply all our need! The building must be complete by the Opening Ceremonies of the new Hospital scheduled for September 26th through October 3rd of this year.